The Nintendo Switch's tablet screen will reportedly be a multi-touch screen - an upgrade from the 3DS and Wii U's single-touch screens. When Nintendo revealed the Nintendo Switch, we were given a lot of answers, but also a lot of questions. While Nintendo itself won't be officially answering those questions until January, a source at Eurogamer has shed a bit of light on the system's tablet screen. The reveal video somewhat cleverly didn't show anyone using the tablet as a touchscreen, but Eurogamer's source is claiming that it does indeed have touch capabilities, and multi-touch ones at that. The source claims that the screen is 6.2" in size, outputs video at 720p, and boasts a multi-touch capacitive screen. This differs from both the Wii U and 3DS, which only have single-touch resistive screens. The Switch's screen on the other hand is a 10-point multitouch display that is similar to what we see in modern smartphones. What does this mean? Well, given the way Nintendo revealed the Switch, we are assuming that the touchscreen will be more of an optional feature to navigate menus and such, rather than a full control scheme. 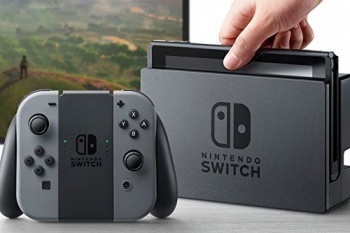 As for when the system is docked, the right hand JoyCon controller reportedly features an IR sensor that could be used in a similar fashion to the Wiimote to mimic the touchscreen feature. What do you guys think of this? Is 720p on the tablet enough? Are touchscreen controls overkill? Personally, I'm worried mostly about the damn thing's battery life, and I feel like a touchscreen would only serve to make it worse.